Onychomycosis is a fungal infection of the toenails or fingernails. 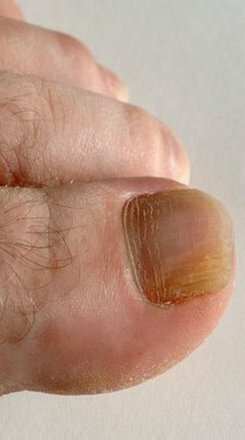 This ailment causes fingernails or toenails to thicken, discolor, disfigure, and split. At first glance, onychomycosis appears to be only a cosmetic concern. However, without treatment, the toenails can become abnormally thick forcing the toe to press against the inside of the shoes, causing pressure, irritation, and pain. If the disease continues to progress without treatment, onychomycosis may interfere with standing, walking, and exercising. It can even result in an infection by causing a sore to develop on the underlying nail bed. Onychomycosis is easily identified by its appearance. However, there are other conditions and infections that can appear similar. The diagnosis of onychomycosis is generally established by laboratory tests before beginning treatment. Treatment for this condition includes oral and topical antifungal medication. Oral medication is the most effective. A simple blood test is ordered before starting on the medication and halfway through treatment to monitor liver function. Some people prefer not to take medication to clear the toenails. In that case, the nails can be trimmed and filed periodically to reduce their thickness and alleviate the pain and problems that develop from thickened toenails. The choice of treatment choice may be affected by age, health status, and other medications that are being taken. Talk with your doctor about what treatment will work best for you.